If you’re looking at putting up a shed, you’re likely considering a number of factors. One detail you may not have thought of is a wind rating. Keep reading to learn what a wind rating is, how it affects the shed you choose, and why it matters. The explanation is simple: a wind rating is assigned by your council to certain areas. The rating itself is determined based on a number of factors, including the geographic region, topography, shielding, and terrain. 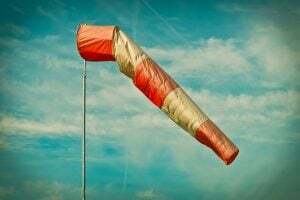 Wind ratings help councils define how strong the winds are likely to be in a particular area, which then helps them determine which buildings are safe to place in that area. Why Do Wind Ratings Matter? In high winds or a cyclone, sheds can become very dangerous. If they are lifted up by the wind, they could injure people, damage property, or even cause death. They can be shredded by the weather and pieces can cause incredible damage. For homeowners, making sure that their back yard does not have a potential projectile is important. Children, pets, or individuals could all be at great risk. If you are installing a shed, it’s very important to make sure it is rated highly enough for your area, especially as extreme weather events increase around the world. How Do I Determine the Wind Rating in My Area? The best way to determine your area’s wind rating is to ask your local council. Because there are so many different factors, the average person is unlikely to be able to determine the wind rating in their specific area. Your local council, however, has determined the wind rating in all areas overseen by the council. By providing them with your address, they will be able to share that wind rating with you. You can then use that information to make sure your shed has the appropriate wind rating for your area. As far as determining the wind rating of a shed that you are considering, ask the vendor or sales person. They should be able to provide you with the rating, and make sure it matches what you have received from the council. How Do I Ensure My Shed Will Be Safe? Good quality sheds will come with a wind rating. As long as the rating meets or exceeds the standards in your area, and the shed is properly installed, it should hold up against the weather in your area. If you’re struggling to find the right shed for your needs, one option is to have a custom shed built. While standard sheds are clearly built at standard heights and depths, custom sheds can have specific factors integrated into the structure, such as roof pitch and openings, which can help the shed withstand heavy winds. Custom sheds can also be built out of more durable materials such as Colorbond or Zincalume. Both of these products feature genuine Bluescope steel sheeting and have a 15-year warranty. We want to make sure that every shed we design or create will withstand the test of time. What Is Involved in Designing a Shed? If you are interested in a custom shed, whether you are looking for your own design to meet wind rating standards or for other reasons, contact Action Sheds. We can add a number of customisation features to get you exactly what you need. We work with each customer to create a design that will meet both your specifications and those of your local council. To find out more about sheds and wind rating, contact Action Sheds today.